2010 Bay Colt AHR 649048 SOLD! Congratulations to Beloved Horses and Sarah Carr on the recent purchase of Graff MF. We look forward to his Reining career! Graff’s grand dams *Era (Carycyn x Eskapada by Nabor) and *Gitara (Eskimos x Gildia by El Paso) are two of the cornerstones of our breeding program. 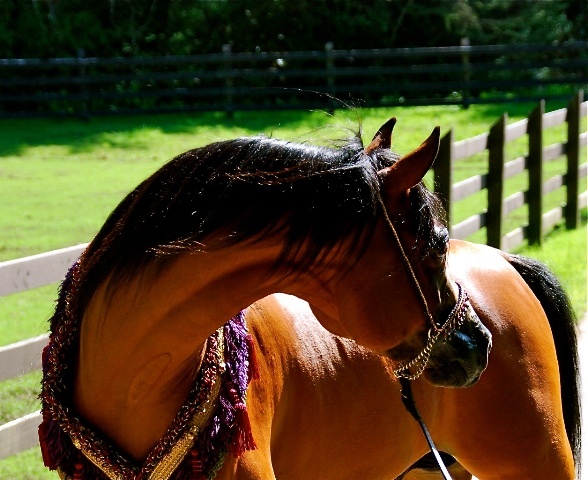 *Era proved her talent as an exceptionally gifted park horse before finding her way to Maplewood, while *Gitara exhibited her strengths in the halter arena, where we campaigned her to multiple wins at an advanced age. Adding to that is the tremendous athletic ability one would expect to see in a pedigree rich with the blood of the immortal *Bask, as well as two crosses to both Comet and the glorious Eskapada. Like his sister Gala, Graff exhibits the beauty and tremendous motion that comes from all corners of his pedigree. He is sure to be a future star! A descendent of *Gitara PASB, he most obviously carries the gene for her legendary neck – arched to perfection. Negatraz characteristics have followed this young colt as well, with huge black soulful eyes and tons of mane and tail. He’s now going under saddle with great working attitude and with plans to be shown. Trainers have suggested with his agility and cat-like speed he’d be a perfect purebred Reining Futurity prospect. This entry was posted in Opportunity, Young on October 15, 2013 by Anita Enander.